The Guardian describes Lombok as the “quieter side of Bali.” Only 20 minutes away from its sister island, Lombok is significantly less developed with greater swathes of natural habitats and beautiful vistas. Both locations are stunning, of course. But Lombok is one of the better choices for those who prefer a quieter vacation more separated from the cities. Here are some things though that you should know. Some of the hotels and resorts offer scuba diving equipment and sometimes even training. Like most of the waters surrounding the Indonesian islands, the wildlife is stunning. The majority of the snorkeling takes place around the Gilis Islands, a popular location among photographers and adventurists alike. However, the Virtual Tourist reports that many scuba divers often get stung by small jellyfish. These jellyfish are not dangerous to most people, but their stings can be painful. Bali is populated primarily by Hindus. Modesty is not as much an issue there. In Lombok, however, the largest religious population is the Muslim community. The Guardian recommends women keeping their arms and legs covered except when at the beach or within the hotel. But one of the other notes that they add is that a key difference in nicer hotels is that they are often farther away from the mosques so that visitors are not disturbed by the calls to prayer. Calls to prayer typically start at 4:30 in the morning every morning. 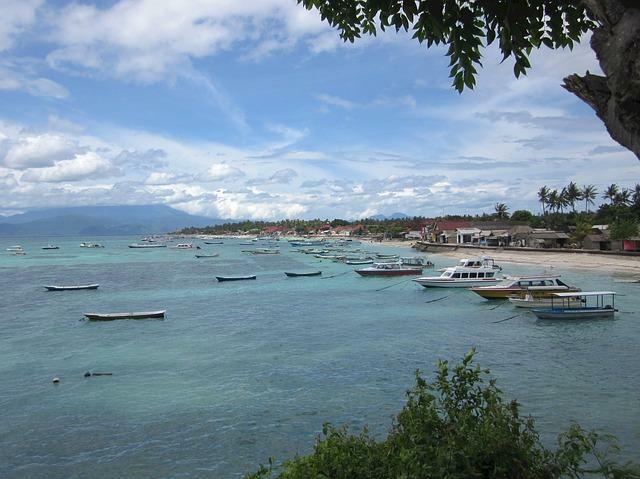 The Lonely Planet describes the overall mood of Lombok as a laid back paradise. Many of the resorts and hotels offer travel connections so that you can make it easily from the airport to the boat to your hotel. However, you should not be surprised if that takes significantly longer than you expected. It is not considered rude. Don’t be upset. The same holds true for most service. Some of the resorts such as Karma Hotel Lombok have service standards that are more in line with what most Americans expect. However, even in those locations, don’t be surprised if there is some waiting. No matter how nice the hotel you are staying in, you should avoid drinking the tap water. Adventure Lombok warns that it is the most common source of infections and illness, though it is all right to drink iced beverages in higher quality hotels and resorts. You should not get beverages with ice from most stands, lower quality hotels, and other similar places. In general, if you are not sure whether the water or ice will be safe, it’s best to abstain. Drink mineral water from sealed bottles instead. If you have a weak immune system, avoid drinking tap water even from the nicer hotels. And always check with the front desk before you do. When purchasing mineral water, make sure that you buy it from a reputable source. Street vendors and peddlers generally only label their water as mineral water when they are in fact using tap water. Fortunately though, most of the hotels like Karma Resorts do provide mineral water so that you don’t have to make a water run yourself. In the larger cities, Internet and cell phone service are fairly good. However, once you start moving into the more rural areas, even quality hotels and resorts will sometimes run into difficulties providing consistent service. Additional roaming and connection fees will almost always apply, not just from the hotel but from your own service provider. Make sure that you know where you are connecting and understand the terms and agreements. Some hotels will simply charge the time spent per minute or per kilobyte to your final bill. Lombok is a beautiful island, and it is certainly one that you will want to visit. It has a laid back atmosphere and a great deal of beauty. Despite this, it is not as heavily populated, particularly among tourists despite a host of attractions. If you do plan on scuba diving, do be prepared for the jellyfish. They are more of an annoyance than a danger. You should also expect the location to be reflected in the price. With many mosques located throughout Lombok, the finer hotels tend to be located in places where the calls to prayer are not as likely to disturb you so early in the morning. You should also expect things to take longer than expected. Punctuality isn’t as important as it is in the States, and this has nothing to do with rudeness or incompetence. You should avoid drinking tap water unless you are certain it is from a good source. As a general rule, just drink the mineral water. You should also anticipate Internet coverage and phone service to be spotty.